Each year, the Idaho-Oregon Buddhist Temple is proud to offer Odori performances for your entertainment. You are all invited to participate in the general dancing; all of the dances are easy, so please do join in the fun. There will be three general dances, followed by an intermission period. During the intermission period, you will see performances by students of Madame Kanriye Fujima (see information below), and general participants will be treated to a complimentary refreshment. Madame Fujima has been teaching traditional Japanese art forms in Ontario since 1960, and has been an integral part of the Obon Festival since its beginnings. She is a practicing Buddhist, and contributes her skills and knowledge of dance to the festival each year. She is called Sensei, or teacher, by students and non students alike, and explained that a folk dance, similar to a circle dance, with light, quick movements, will be part of the celebration. 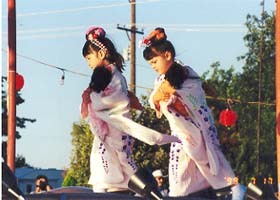 The dance is known as Odori, and Sensei said it is like follow the leader, and anyone can join in the movements. Traditional Japanese dance is a big part of the country, growing out of the Kabuki theatre tradition, Sensei said, and relates traditional folk tales through dance. 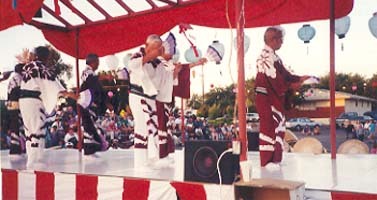 Dancers wear elaborate makeup and costumes, sometimes including masks for these stage performances, Sensei said, adding the classical dances are extremely difficult to learn and perform. Sensei was born Hidekko Fujita in 1923 in Yamaguchi, Japan, near Hiroshima. Her full stage name is Madame Kanriye Fujima. She was trained under the traditional master/student style in Japan from the age of six. Her education was comprised of a rigorous schedule of lessons that began after the end of her regular school day. Her training was originally in both music and dance - she plays the three stringed samisen - but eventually focused solely on dance. With World War II came an intermission in her training when she was 15. During those war years, she became part of the government's military propaganda and was enlisted to perform patriotic pieces for government assemblies. After the war ended, she resumed her studies, and in the traditional way, served as a cook, housekeeper, baby sitter and maid in her master's home. Even so, things had changed. The training system had been disrupted by the war, and while it was once standard for dance to be carefully segmented among specialists who handled makeup or costumes or choreography, now the young danger was taking on all those tasks. She was licensed to teach in 1946 and in 1947, and became a master of the Fujima school of dance. She married a first generation Japanese immigrant, Etaro Takaki, in 1956 and moved to Portland. Her goal of teaching dance to children progressed quickly, and within months, she had a sizable amount of students. Her husband died soon after in 1958, and she returned to Japan for a few months. She decided that her life's work would be teaching dance, even without her husband, and returned to Portland. Over many visits to Ontario, she met Minoru Fujita, a local restaurant owner. They married and she moved to Ontario in 1960. For many years after, she traveled regularly to Portland and Spokane, Washington, to teach at least 30 students in each city, along with her work in her basement studio in Ontario. She has since retired from this traveling, but still maintains 13 to 14 students in the area. She was featured in the 1987 book "Footprints Across Oregon" by Mike Thoele, and was the subject of a masters dissertation by prominent Eugene folk dance instructor, Barbara Sellers. Sensei says there is no end to learning in dance, and so her journey continues.